I describe. I write. 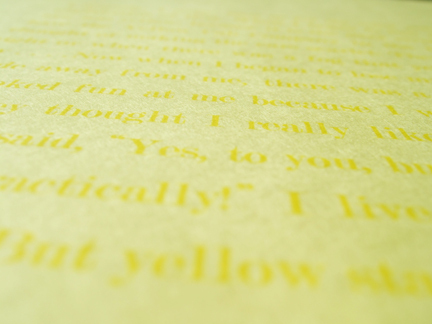 Now as for the color yellow, there is a physical explanation of that. 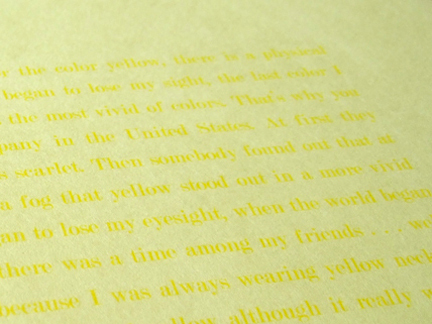 When I began to lose my sight, the last color I saw was yellow, because it is the most vivid of colors. That’s why you have the Yellow Cab Company in the United States. At first they thought of making the cars scarlet. Then somebody found out that at night or when there was a fog that yellow stood out in a more vivid way . . . Now when I began to lose my eyesight, when the world began to fade away from me, there was a time among my friends . . . well, they poked fun at me because I was always wearing yellow neckties. Then they thought I really liked yellow although it really was too glaring. I said, “Yes, to you, but not to me, because it is the only color I can see, practically!” I live in a grey world, rather like the silver screen world. But yellow stands out.